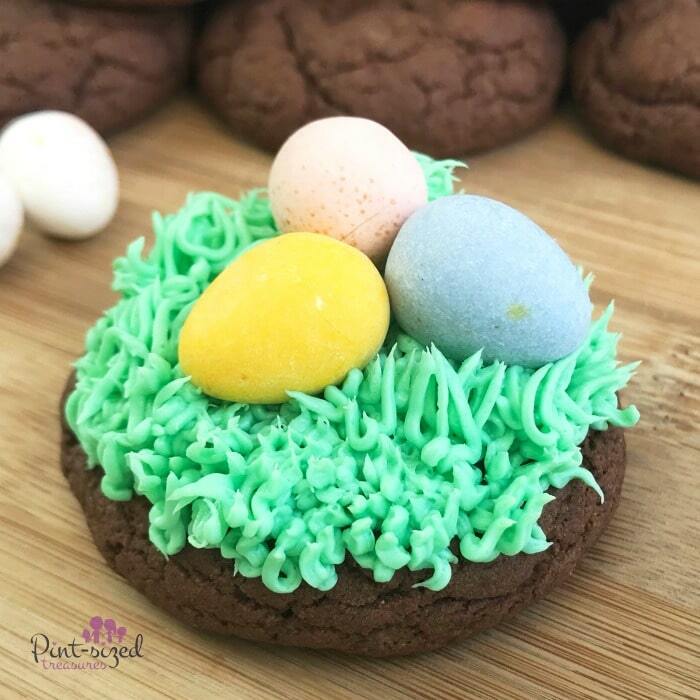 Easter egg cookies make springtime so much fun! These cookies are bursting with colors,(just like our favorite rainbow cookies!) but they’re crazy-easy to make! Enjoy! 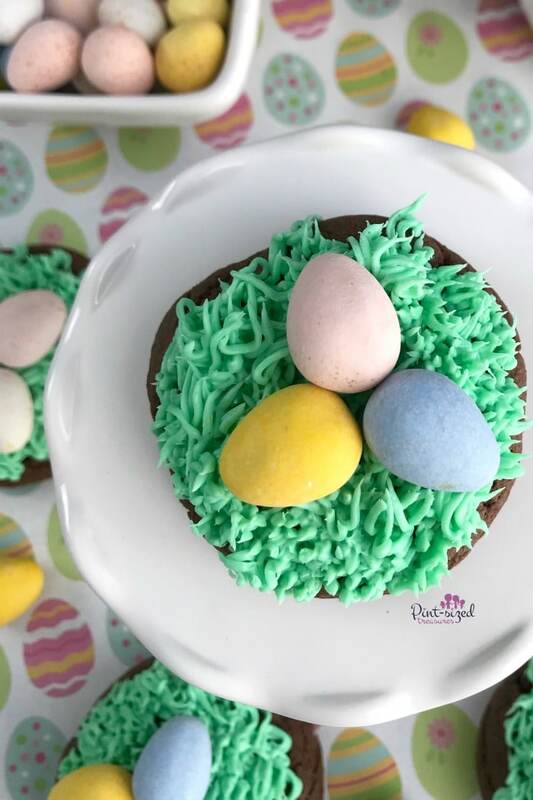 Though life seems all a rush, there’s always some time to bake super easy cookies — like these adorable, Easter Egg cookies! Have you ever tried cake mix cookies? They’re the answer to our busy lives when we still want a no fuss, less mess, home-baked cookie! Well, that’s exactly why these cookies are so easy! They’re made from a mix! And so are these cookies that are topped with rainbows! And you’ll not want to miss these easy cookies that are stuffed with Nutella! Seriously…cake mix cookies have transformed our perspective of homemade cookies. They no longer seem daunting or time consuming! These HUGE cake mix cookies right here taste like giant, homemade Oreos. So good and so fudgy! There’s even cream inside and that’s homemade too! 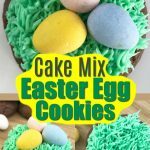 I call our Easter egg cookies and all our cake mix cookies semi-homemade. And don’t let the lush, green grass on top of these cookies intimidate you. It’s simple to get those bright green blades! When you create your frosting below via our recipe, simply pipe a straight line of frosting on top of the cookies pull up at the end to create one blade. you can find the perfect frosting tip for piping grass right here. Continue doing this in a truly sporadic but a tiny bit organized fashion —just like real grass grows. And use disposable piping bags like these so it will be less messy! Oh, and I’ll let you in on another easy tip! They’re just as bright and colorful and you may have some in your pantry or fridge! But the candy eggs do have a speckled, lighter pastel touch to them, so they’re my top pick! Since it’s getting close to Spring time, definitely invite your kids to come bake with you in the kitchen! Toddlers, preschoolers, big kids and teens can all get involved! Some of our best parenting moments are in the kitchen! Psst! We have some easy meal ideas that kids can make all by themselves right here! Just in case one of your kiddos has a passion for cooking or baking! 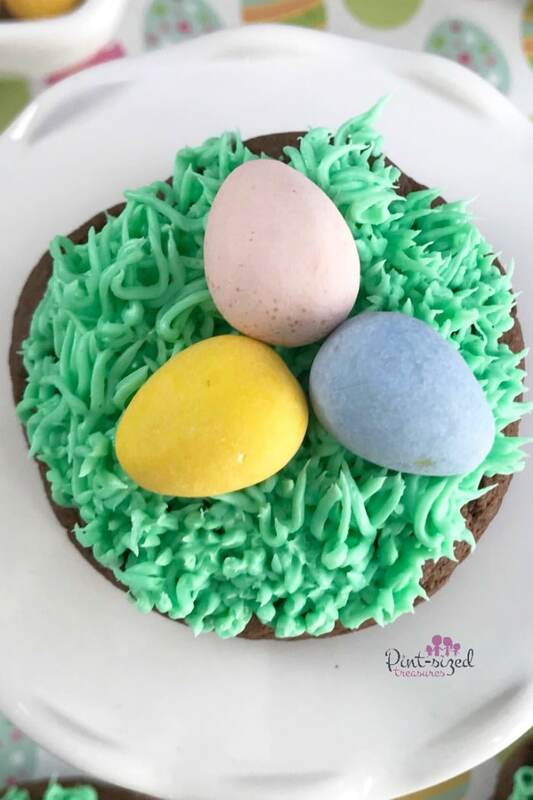 Grab your easy Easter egg cookie recipe below! Be sure to share your baked cookies with us on Facebook. We’d love to see your cookie creations! Don’t forget to join our Fave Recipes for Families group too where you can load up on the BEST recipes for families like yours! See you there! Affiliate links have been added to help you create your cookies! 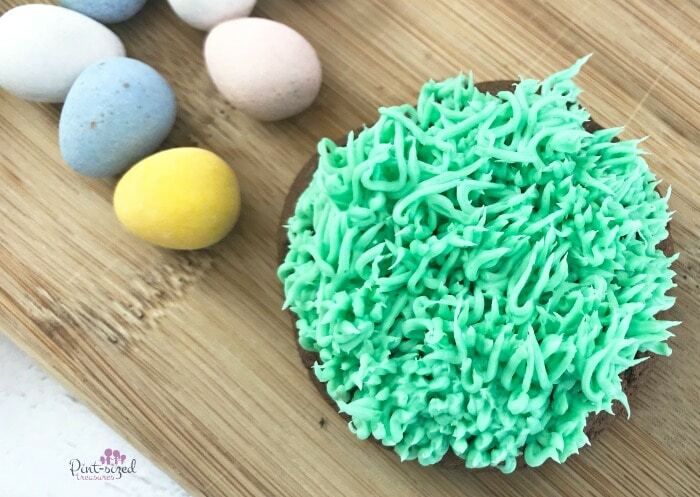 These are the EASIEST Easter egg cookies you'll ever bake! 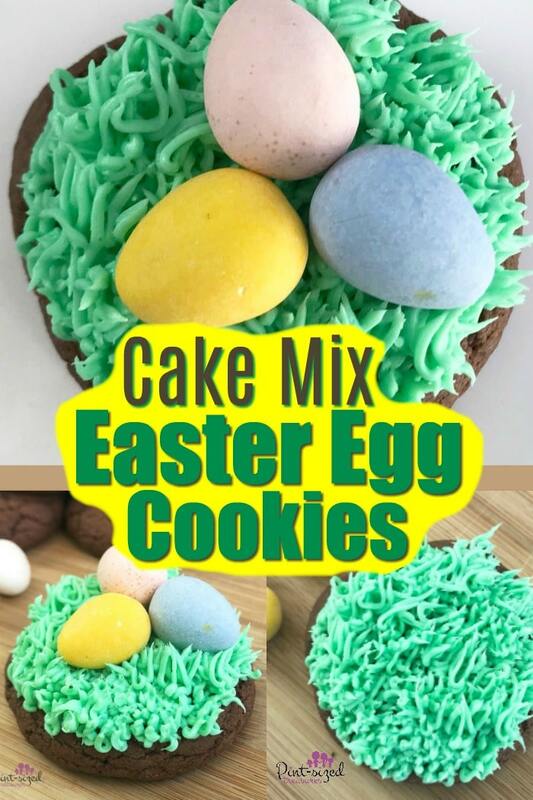 we included some crazy simple hacks that helps you create a colorful, yummy, Easter cookie that's no-fuss! Enjoy! Roll the cookie dough into 2" balls and place 2" a part on a baking sheet. If cookie dough is too sticky, refrigerate for two hours to firm. Combine the powdered sugar, melted butter and vanilla extract in medium mixing bowl and beat on medium high speed for two minutes. Add a few drops of green food coloring and beat again until ingredients are incorporated. Once the cookies have cooled, gently squeeze the frosting out of the piping bag, gently pulling up to make 'grass' on top of each cookie. Repeat. Place 2-3 eggs on top of each cookie. Serve immediately or refrigerate unto five days.